A full system dedicated to conversation and music in car with colour TFT 2.4’ Screen. Made for iPod. In addition to conventional telephony functions - pick up, hang up, dual calls - the Parrot MKi9200 boasts cutting-edge telephony functions: automatic phonebook synchronisation, training-free multi-speaker voice recognition, speech synthesis of the names in the phonebook, contact management (up to 2000 per phone), call records and so on. Its colour screen displays the phonebook, caller ID (and photo), phone information and user settings. The menus and phonebook are also audible for easier, more intuitive use. To ensure optimal audio quality when on the phone, the Parrot MKi9200 combines double microphone technology with new signal processing software (DSP-3) that eliminates background and surrounding noise, including noise from inside the car. For maximum listening quality, conversations are reproduced over the vehicle's speakers. The Parrot MKi9200 is a Bluetooth hands-free system compatible with all vehicle* makes and which works with all mobile phone brands. The Parrot MKi9200 is also gifted for music. Supplied with a specific cable, it is compatible with all music sources, such as iPods, iPhones, USB flash drives, Bluetooth stereo (A2DP) phones, MP3 players and any other analogue players. The Parrot MKi9200 also features an SDHC-compatible SD card reader on the side of the screen. The MKi9200 displays the full playlist along with the name of the artist, the title and even the corresponding album cover in colour when available on the iPod, iPhone or USB flash drive. Music is delivered through all the car's speakers*, giving the driver and passengers exceptional sound quality and the breathtaking Virtual SuperBass and Sound Spatializer effects. * Functionality available on the majority of vehicles, however we advise you to ask a Parrot Certified Installer or another technical car specialists, prior to any installation to ensure that your vehicle does not require any additional equipment to benefit from this feature. To checkcompatibilityfor your phone or kit. Some stand out features of the Parrot MKI9200 over the classic CK range are:-Colour screen, dual phone mode, music streaming and voice dialing without the need to record voice tags for each contact. 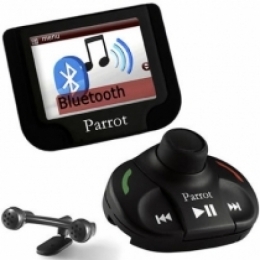 Parrot MKi9200 A full system dedicated to conversation and music in car with colour TFT 2.4&rsquo; Screen. Made for iPod.